The Data Table provides an alternative way to enter, change or verify your data. 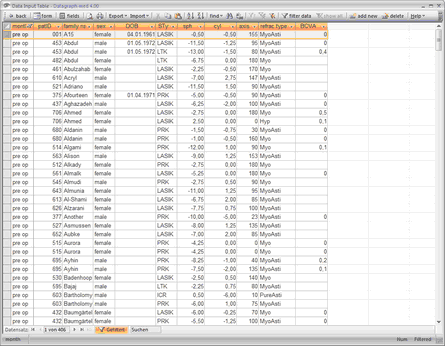 Similar to MS Excel you data can be displayed in an 'spread sheet like' view. 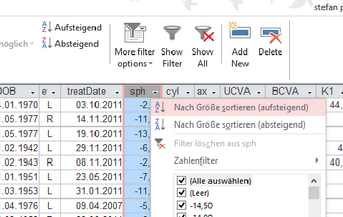 It is especially useful to sort, filter and export data. It also helps in finding typing errors. Please note that by default only preOP values are displayed. Use the filter settings icons on the icon bar, to include follow up data to the table for example. 'Filter on current selection'; 'Filter excluding current selection'; 'Filter by form' (not available in Runtime Installations! ); 'apply Filter by form' and 'remove Filter'. Filters are an elegant way to reduce the amount of data displayed. Place the cursor in any of the fields in the data entry form and click on the 'More filter options' icon --> only data with the current field value will be displayed. Note you can apply this filter more than once. For example - fist click place the cursor on 'Myo' in the refr. Group field and click on the filter button --> only your myopic cases will be displayed. Then place the cursor in 'eye' field and click again - only Left (or Right) eyes of myopic patients will be displayed. Note: Double-click on an individual row, will change to the 'form view' and display this patients eye data.